Set in 4 acres of land with its own forest school, our EYFS (Early Years Foundation Stage) is promoted in the most natural way in our beautiful environment. Our future plans include our own children’s farm by 2018 with natural resources in each designated area to encourage the learning and development of children from baby stages to school and beyond. These spaces will include ateliers for IT and creative thinking; planting and growing facilities; a maze and wheelies; under 2s private garden; climbing, open theatre, mud kitchen, and sensory and sounds areas. Children love exploring and enjoying our stunning grounds – running, cycling, hiding and reaping the benefits of outdoor play with their friends. Our team of Educators are always on hand to support and develop the children’s ideas and help them to learn to keep themselves safe alongside taking appropriate risks and challenges. Our pre-school researchers go out to our forest school for 3 hours twice a week but as we grow we plan to be out every day come rain or shine! We are proud to have been awarded the Ofsted Oustanding Award. This award is only given to providers judged to have outstanding overall effectiveness in an Ofsted inspection. With parent consent, we take our children on regular local trips to the park or to the library to enthuse their passion for stories and reading. We believe in healthy living so as well as lots of fresh air, our children receive tasty and nutritious meals made freshly by our in-house chef. We find even the most fussy of eaters can be persuaded to try new things when seeing their peers eating in our group dining environment and we are experienced in preparing special meals for children with allergens when required. Our staff ratios to children are higher than the mandatory numbers with no less than one Educator to five children and 1-3 in our baby room. We offer many unique benefits including yoga by our qualified children’s yoga trainer, onsite hairdressing, IT and French lessons and breakfast-on-the-go for our parents. We believe in building family partnerships and our online parent portal and regular parent activities ensure you have the best relationship and experience with us. We have employed a full time caretaker to deal with internal and external maintenance, repair, improvements and renewals to ensure our internal and external grounds are safe and meeting the highest standards. Our ambition is to create a family hub that children, parents and the local community can enjoy. We believe it is vitally important to promote parent and child interaction and we hope to open weekend facilities for the family. 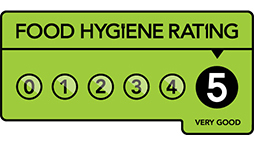 We are proud to have been awarded the highest food hygiene rating of 5 by the Food Standards Agency. "We aim to encourage children’s passion for learning and to help them identify with their achievements so they can become self-assured and creative thinkers. Our approach to learning and development has been created to support children throughout their early learning journeys, so they gain the confidence and skills to succeed at school and beyond."